There are three parts to this page. Quick instructions to find the Windows 8 Shut down button, creating a shutdown tile for the Metro-style UI, and learning the Shutdown switches. 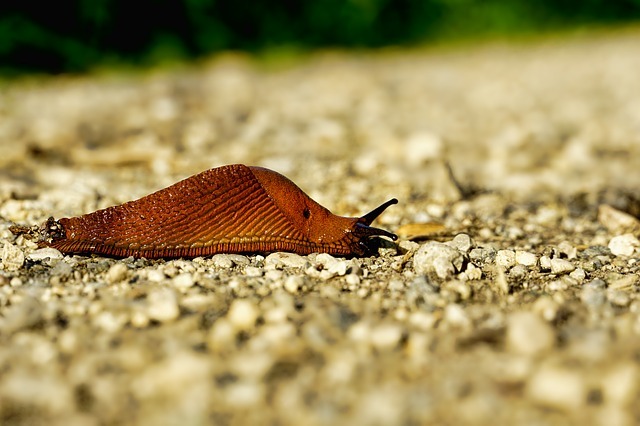 Your First Decision – Turn Off or Reboot? Before I discuss tricks with the shutdown executable, a few words for those newbies who are struggling to find the normal shutdown button. Firstly, ‘Sign out’ by clicking on your account icon, then at the main front screen seek out the Power button (see screen shot below). Click, and you have the option to Shut down or Restart. Surprisingly, the Alt +F4 brings up the Shut down or Sign out screen. Another keyboard method is to call for the Power button by pressing WinKey +i. Windows 8 Shutdown Plan B – Turn on the Charm! Many users prefer to bring up the 5 'Charms' by touching the right side of the screen, select the Settings cogs, and then click on the Power button at the bottom of the screen. 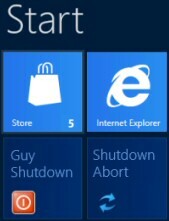 Here are instructions to create a Shut down button in the Windows 8 Metro interface. Confession: it took me three goes before I got it to work. My point: there is less scope than usual to deviate from the ‘official’ script. It helps if you understand these 3 underlying principles. Note: Start at ProgramData not ProgramFiles. You can Pin (and Unpin) tiles to the Metro UI. Start on the Windows 8 desktop, or in a new folder – anywhere except in the Start Menu folder! Name the shortcut after yourself, e.g. Guy’s Shutdown, that way you will recognise it easily! From the Metro-style UI, type the name of your newly-created short. Right-click and 'Pin to Start'. Paste the shortcut. You may wish to click on the advanced button and ‘Run as administrator’. In passing you can see that it’s not possible to create a new shortcut here. It’s reassuring to see your shortcut amongst the other Apps. Return to the Metro UI start screen – Windows Key is the quickest way. Now, you may see your shortcut at the extreme right of the Metro screen. If not type the first letter, then you should see a list of Apps beginning with that letter. If yours is there, then Right-click its icon and see if it says Pinned or Unpinned, naturally you want it to be Pinned. See more on how to create a Windows 8 Metro-style Tile. Change your shortcut’s icon. Right-click, Properties, Change Icon. There is a classic orange square with a vertical line. See screenshot above. Tweak the Shutdown command, at least while your testing you may wish to change /t 20 to /t 120. The benefit is you can go to the command prompt (or PowerPoint) and issue the counter-command: Shutdown /a. This aborts the shutdown. Challenge 1: Make a second tile but with the Shutdown /a command. See screenshot above. Challenge 2: Create a tile that instead of shutting down, restarts your Windows 8 computer. Key command Shutdown /r. The rest of this page explains how to fine-tune the shutdown command by appending a variety of switches. While you can execute shutdown from the command line you can also run it from a GUI by typing Shutdown -i. Incidentally, this highlights a heated debate, should you precede switch with a slash or a hyphen? Frankly, it does not matter, for instance, Shutdown /i works just the same as Shutdown -i. People often wonder why you need the /s (Shutdown) switch at all; well, the reason is that you need to tell the operating system whether you want to turn off the machine with /s, or alternatively reboot with /r. Here is an example to restart a server called ‘BigSrv’. Note 3: Remember the sequence of switches is vital, hence shutdown /m /s \\Laptop does not work, too many switches, and not paying attention to their order gets me into a tangle. Note 4: By default, the UAC (User Account Control) interface will not allow remote shutdown, I have my UAC turned off, so had not noticed. I thank Per Johansson for this additional information. Sooner or later everyone makes the mistake of accidentally shutting down the local machine instead of the remote target computer. To cancel the command practice with Shutdown /a so that you can always abort a mistake within the 30 second default before the shutdown starts. If you make a more serious mistake and apply the Windows 8 shutdown command to the wrong machine then you are in trouble. No amount of trying Shutdown /a on the local machine will have any effect. You have to run to the target machine and issue the cancel command at that machine. My plan B is to launch remote desktop, there is a faint chance that I can connect in time and issue Shutdown /a. shutdown /r /m \\Laptop – Reboots a remote machine called ‘Laptop’. Shortcut -i Press OK and a shortcut is born. /t is for time. Is 30 seconds too long (or too short)? Adjust the setting with /t 10, and thus display the dialog box for 10 seconds. Maximum is 600 seconds. /f is for force. This means shutdown is coming, ready or not! Shutdown /r /f restarts the local machine, and closes all programs without warning. /c is an option Microsoft included so you can add a comment. I only use this when applying Shutdown to remote machines. Would you let people know who is in charge, who is shutting them down? /c "Guy is shutting you down"
/d p:4:1 reason. I would avoid this switch, the syntax is tricky, the numbers obscure, and worst of all it does nothing exciting. However, the idea is sound, it enters a reason for the shutdown in the event log. If you activate shutdown’s help, then you will get a whole list of major and minor reasons that you could employ with this switch. For me, this switch is simply an option I would rather not take. PowerShell has a Stop-Computer, which is very similar to the Windows 8 shutdown -s command. 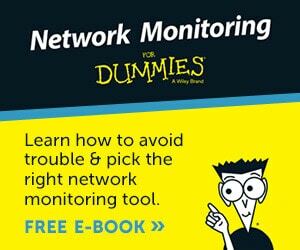 A likely scenario is that you wish to automate the reboot of a remote server. With a tiny substitution of ‘Restart’ for ‘Stop’ you could change the command so that it reboots the computer. See more about using PowerShell’s Stop-Computer cmdlet. Trust me, every organization has a joker, someone who thinks it’s funny to use shutdown -s or -r to play pranks on colleagues. 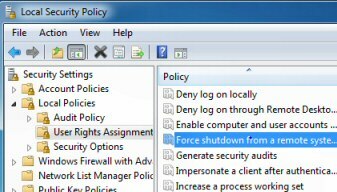 The good news is you can configure a policy to prevent ‘Force Shutdown From A Remote Machine’. Experiment by assigning just your account, rather than all administrators. See also group policies to control Shutdown: Clear pagefile. 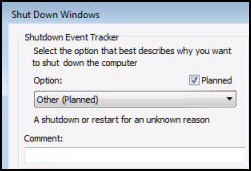 How to disable the Windows 8 shutdown tracker. Learning Microsoft’s Windows 8 shutdown command line switches is satisfying, and one day they will save you a long trek when you want reboot a remote computer. My advice is to perfect the /a (abort) switch, that way you won’t panic if you issue a command to shutdown the wrong machine.